Lagoon is no stranger to voluminous amounts of water. For 50 years it boasted a “million-gallon” swimming pool and today it features several attractions meant to soak and drench sun-parched guests. There are, however, instances when the forces of nature take their toll and the park has its fill. At the foot of the Wasatch Mountains, Farmington was prone to flash floods. In 1920, flooding of Farmington Creek only had a small impact on Lagoon. About two feet of mud filled the swimming area that spring, but crews acted quickly to have the park ready for opening on Memorial Day. A sudden storm in August 1923 took the lives of seven people in Farmington Canyon. A recounting of the event in a 1990 Deseret News article said, “At Lagoon, an elderly woman and child were carried downstream before being pulled from the water by Dr. R.C. Robinson, who was awarded a Carnegie Medal.” Some sources also suggest minimal damage from flooding in 1927, but so far no record of any notable damage has been confirmed. Finally, in the 1930s, the Lake View Camp of the Civilian Conservation Corps built terraces on the hillsides to minimize hazards from large amounts of water exiting the canyon. Map from 31 May 1983 Deseret News. Runoff from record snowfall in the winter of 1982-83 caused problems up and down the Wasatch Front. Even State Street in downtown Salt Lake City was transformed into an urban river. 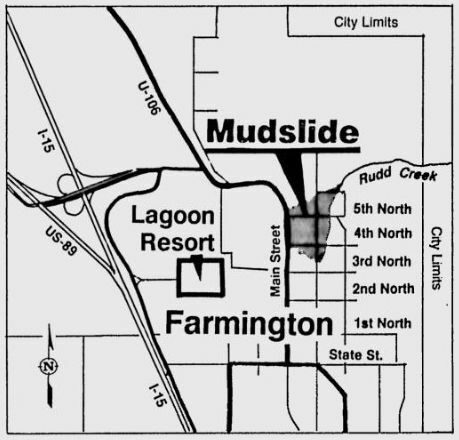 In Farmington, mud and debris from Rudd Creek pushed its way through Main Street, down 3rd North to Lagoon Lane and emptied into a pastures east of Pioneer Village (now occupied by Rattlesnake Rapids). Upstream from the park, Farmington Pond collected debris from Farmington Creek, sparing Lagoon and many homes from further destruction. Crews worked day and night pulling wreckage from the creek around Lagoon. Mud and silt covered areas of the park – as deep as eight feet in some places. Memorial Day crowds were asked to return home and the park was closed for four days. Repairs had to be made to the tracks of the Wild Kingdom Train and cleanup around the park continued until the following spring. Musik Express’ “decorations, lights, canopy and scenery had to be refurbished and replaced three times” in 1983. Flooding from mountain snow runoff as well as the rising Great Salt Lake threatened the area in 1984, but diversion canals and flood control basins were being put in place by then. Instead, Lagoon was faced with problems caused by heavy snow during the winter of 1983-’84. The amassed snow ruined rooftops of buildings in Pioneer Village, the European Carousel and asphalt walkways. Once again Lagoon worked quickly to have the park ready for visitors. New concrete was poured at the Main Entrance, rooftops were fixed and the European Carousel was replaced by the Red Barons ride which still operates today. Regardless of what the weather brings, history has shown that Lagoon employees always work hard to clean up the park each spring. Flood Fighters, 1983-84: An Account Of The Mudslides And Flooding In Davis County, Carr Printing Company, Inc., Bountiful, Utah. 1984. Lagoon Ready For Memorial Day Opening. Deseret News, 27 May 1920. ‘Wet sponge’ state may put drain on taxpayers. Deseret News, 31 May 1983. Lagoon losing a lot of cash. Deseret News, 1 Jun 1983. Davis facing double flood dangers. Deseret News, 29 Jan 1984. Raindrops keep falling on Lagoon on opening day. Deseret News, 20 Apr 1984. Watershed terraces built by the CCC still keep Davis area dry. Deseret News, 16 Apr 1990. Mudslide memorial gets good reception. Deseret News, 7 May 1993. Flood Fighters, 1983-84: An Account Of The Mudslides And Flooding In Davis County, Carr Printing Co., Inc., Bountiful, Utah. 1984. I remember that year. I worked there that summer and helped sandbag to save Pioneer Village. That was my first few days of work. I lived in Farmington then and saw all the mudslides and flooding. It was amazing that Lagoon didn’t get it worse than it did.